How do I move my castle? Go to the world map. I have refreshed many many times. due to this not being an isolated problem and many users affected ..... tickets submitted and no emails back with reference number or anything else. Is it time to look at the problem your end yet? Game is unplayable whilst not able to relocate is all and no point in continuing if you don't address this problem. I see people speaking about this 2 months ago?? Not entirely sure about this, but I think the game takes into account your Character Level and the level of those castles you need to be near in order to attack/defend. I myself have tried moving my castle a spot where in my view it should have been allowed to move, but because all the castles within reach where of a very low level compared to mine, I could not move to the spot I wanted to go, I have had to backtrack until the game would allow me to place my castle. Or you wait 20hs and move again for free. 1950 gems to move again if you do not want to wait. 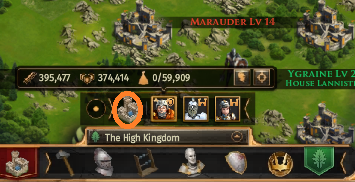 I keep double clickking the castle icon as per the ilustrated instruction and nothing happens....Is there anything I should be doing in addition to make it work ? 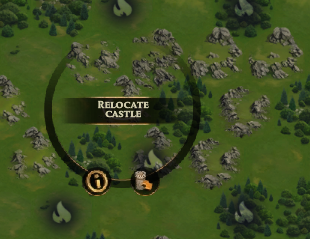 You click the place you want to put your castle, and when the circle pops up, click on the little downward swooshie arrow at the bottom "move castle". When a popup comes up says you can move then you are too far from other players, maximum has been 120 spaces from others OR you're too close by another player, you need at least one space between you an another player. Moving your castle is free every 20 hours. Moving does not work..sort it..please..it makes the game frustrating. is it related to how many gems etc you have bought... or is it just a payment thing because I have seen may player move in and out of an area? While it's nice to be near your Alliance, if you're being attacked by one persistent scumbag remember that all he has to do is look up your name to find you again. Move castle still does not work. Sometimes it does sometimes it does not. Others zip about in and out of squares on the map. I presume that it is a one rule for the poor and another for the rich thing. Is it just a bit of scrappy programming ? Or is it that it should not work first time so that you can spend endless hours checking every square on the map!!!! Boredom beckons . perhaps I am really glad that I have not paid anything yet otherwise I would really be piffed off. Age of Empires never had these problems. Have been trying to relocate for two frigging days with no results. You need to get this fixed. You have no problem throwing up adds for gems and other stuff but you can't fix this relocation thing. good explanation by Tybalt up above. what I have found is that on Marsh I can only move a few tiles at a time and again the time limit kicks in unless you spend gems. so try moving a few tiles at a time if you are getting frustrated with not being able to move to your desres immediately. I relocated my castle but when I tried to attack a neighboring castle a window popped up that read "Invalid position" Does this mean I'm too close to the other castle??? @RichardLionhart (US1) no, that window is a bug in the software. It comes up sometimes when you try to attack marauders, join battles, etc. Refresh your browser and you should be able to continue play without the pop-up.